NiKKi Fron unites positively with academic organizations and executive departments as well as central and local enterprises to promote research of new technologies and to create new concepts. 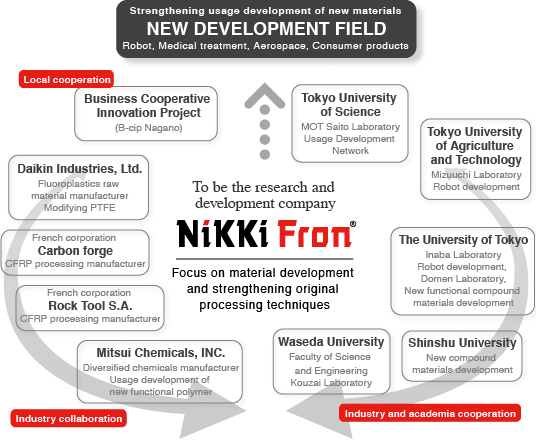 NiKKi Fron group, a member of the Tokyo Chamber of Commerce and Industry, the Paris Chamber of Commerce and Industry, and the Nagano Chamber of Commerce and Industry actively exchanges views with other members and seeks chances for collaboration so as to strengthen industrial collaboration in a global business base. At various exhibitions sponsored by the Chamber of Commerce and Industry, NiKKi Fron set up a special booth, and we extensively publish our products’ concepts and technology for the future potential of our company. This project started on March 14, 2009, to co-create a new business model in the Nagano area with the members of 9 companies from different business models. They participated in the “UFO Nagano manufacturing co-creation cram-school’s MANAGEMENT PRACTICE COURSE” in 2008, the business activity of the steering committee of Nagano City manufacturing support center. Three more companies, which emerged from the second term of the Management Practice Course, joined this project in 2010. 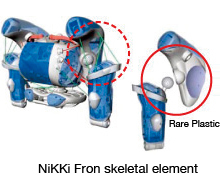 (12 companies) NiKKi Fron Inc.
Shinshu Togakushi Soba Co., Ltd.
Shinano Chemical Industry Co., Ltd.
- Conducting joint research on advanced processing techniques. Copyright (c) 2011 NiKKi Fron Co., Ltd. All Rights Reserved.